Ages 11 through 17. Here is a collection of high-interest activities that can be used to develop auditory processing, vocabulary comprehension, and oral communication skills. Each lesson targets words commonly encountered in magazines, newspapers, and classroom reading material. Words are introduced within short paragraphs that are presented orally by the teacher or read by the student. The paragraphs provide students with a meaningful context for the learning of new words. The activities give students practice in defining words and using these words within sentence contexts. Questions related to the information presented in the paragraphs build comprehension, memory, and inferential thinking skills. Game activities are included to build auditory processing and verbal reasoning skills. All of the worksheet activities may be reproduced. 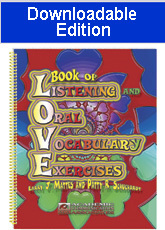 If you are looking for practical, high-interest language activities for older students, try the Book of LOVE. The CD includes the entire book in a PDF format that can be used if you have Adobe Reader on your computer. This program is available at no charge from www.adobe.com.